The Trail Youth Action Network (TYAN) is inviting local youth, ages 13-18, to join the Trail Youth Advisory Committee (YAC). Contact Geoff if you would like to help plan youth events and activities, gain committee experience, grow as a leader, and meet twice monthly to plan and run groups, activities, and events to help make Trail a more awesome place. 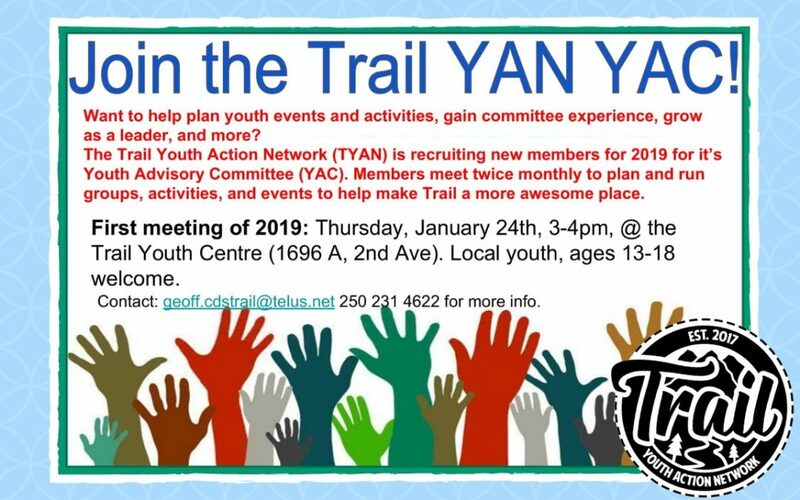 The first meeting of 2019 is on Thursday, January 24th, from 3-4pm at the Trail Youth Centre!